After struggling for a while with trying to maintain my schedule and tasks on a combo of my phone, iPad, and work computer, I'm giving a paper based system a go. I've had diaries in the past but have always ended up with bits of paper going everywhere, so I've decided to try a Filofax. Well, to be fair, I don't actually have a true Filofax yet, I've got a debden-Collins (which I think is mostly found in Australia and New Zealand) in the equivalent of pocket size. If it works for me then I'll shell out and get a Filofax, probably a personal chameleon I think. I need to know if it's a good option for me before I spend all that money, they are not cheap, although if it's a good system for you then it seems like it would pay for itself compared to buying a new diary each year. Side rant - the prices in NZ compared to the states or the UK. We're used to things costing more here than overseas, but an organiser that costs $69 on the filofax USA site costs $169NZ on the Filofax NZ site, which is the equivalent of $132 US! Nearly twice as much! Why so much more?! Anyway, rant over, I'll find somewhere else to buy it. I'm a very visual person, and I like my everyday items to look pretty, so the plain dividers weren't really doing it for me, so I made some new ones, which I like a lot better. These are yet to be hole punched, as we don't have a hole punch at home so it'll have to wait until I'm at work. I used the address tabs as a template but I think next time I would use larger/longer tabs. These dividers are very nice! Did you use scrap booking paper or is it something heavier? I use a personal size Osterly Filofax and think it is definitely worth the initial cost. 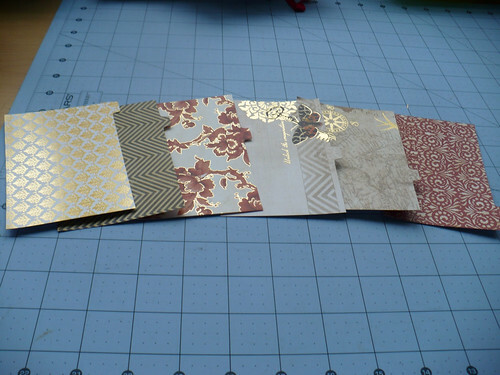 They are scrapbooking cardstock, I think normal scrapbooking paper would get ragged pretty quick. Glad you like them! I found your blog through Philofaxy (lovely dividers!) and just went back and read your archives. 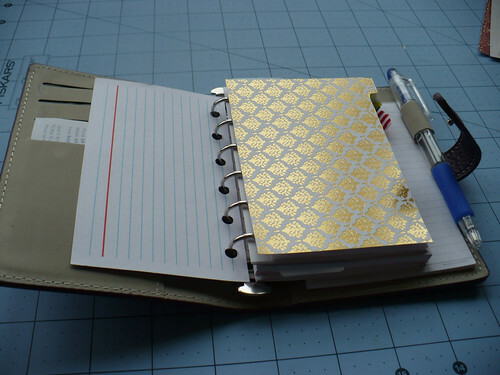 I'm adding your site to my Google Reader because I share some of your same interests - sewing, quilting, Filofax, and papercrafting, although I've never tried making cards, only simple scrapbooks. Very nice dividers! So shiny! Those are some GORGEOUS dividers! Nice to see another Kiwi out there in the blogosphere!